What Can Hospice Care Do for Your Senior’s Pain? For family members who are dealing with chronic pain at the end of their life, pain relief might seem like something that is impossible. Hospice elder care services can help you and your senior to manage her pain effectively so that she can have a much different end to her life than she might have anticipated. When someone is in pain, no matter what stage of life they’re in, their overall quality of life isn’t so great. Relieving that pain is something that immediately improves your elderly family member’s overall quality of life immensely. The absence of pain is powerful and it can give your senior the break that she needs in order to be able to enjoy the time that she has left. It’s amazing how much better your elderly family member’s mood can be if she’s no longer in immense pain. Pain robs your senior of the ability to approach her situation in the right frame of mind. If you’ve ever had pain of your own, such as muscle pain or headaches, you might have an idea how that impacts your mood. But chronic pain never lets up, which is even more damaging to your senior’s ability to look up. Help Her to Rest Better. With the relief of chronic pain, your family member might find that she can rest much more easily. Sometimes this means that she’s able to get better sleep, which also helps quite a bit. But more often it means that your aging adult is able to rest without being uncomfortable. Pain can cause her entire body to remain tense and leave her struggling to find a position that is even remotely restful. Allow Her to Interact More with Family. Pain can be a huge distraction for your aging adult. She may seem “out of it,” which could make conversations difficult. Even if she’s able to maintain conversations, she might be edgy or unwilling to communicate in full sentences. 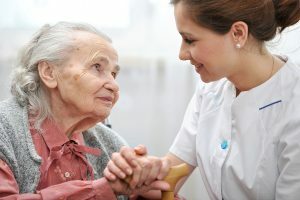 Pain relief allows your elderly family member to be in a position where she can enjoy the people who are there with her and she can interact with them more openly. Hospice elder care providers work closely with your senior’s doctor to help her to experience the most pain relief possible. The goal isn’t to keep her sedated or quiet at all, which is something that some aging adults fear when they enter hospice situations.